★★★★★For the girl who loves to try on various of outfits! 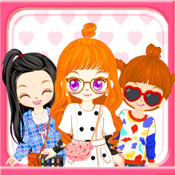 ★★★★★Dress-up Pad to Drag & Place outfits directly! ★★★★★Email your design to friends!